City Hostel Flora is a cosy hostel in the centre of Budapest. 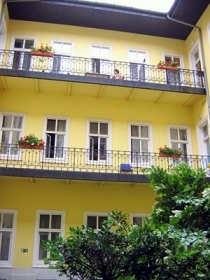 It is situated in a quiet street, but the Grand Boulevard are next door and the river Danube is also close by. The building is recently renovated and we offer private twin rooms with new furnitures for our guests. Two rooms share one bathroom and a kitchen together. In the hostel there is internet access in every room and also a community room with billiard, and laundry facilities. Public transport connections are excellent. The tramline 4-6 on the Boulevard and Metro no.2 at Blaha Lujza tér. Come and enjoy the taste of Budapest!